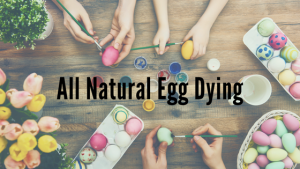 Ditch the dye tabs and try dying your Easter eggs with all natural ingredients that you probably already have in the kitchen. This has been something I have wanted to try for a few years and I finally did! It took some trial and error but I think the final product turned out well. I got three colors to turn out the way I wanted. Beets– The beets will give you a pink to red hue. In a saucepan add 4 cups chopped beets, 2 tablespoons white vinegar, 2 cups water, and a pinch of salt. Bring to a boil then simmer for 30 minutes. An option is to boil the eggs in the beet water or put in a jar until you achieve the color you want. Turmeric– Turmeric will make a dark yellow color. In a saucepan add 4 tablespoons or turmeric, 2 tablespoons white vinegar, 2 cups water, and a pinch of salt. Bring to a boil reduce to a simmer for 30 minutes. 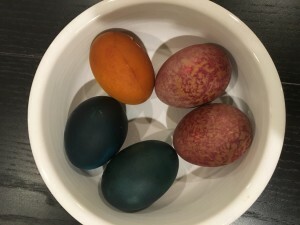 Once cool dip eggs or put in a jar until the color is what you want. Purple Cabbage– Purple cabbage actually gives you a blue tone. In a saucepan add 4 cups cabbage chopped, 2 tablespoons white vinegar, 2 cups water, and a pinch of salt. Bring to a boil and simmer for 30 minutes. Let cool dip or put in jar until the color you get the color you want. A few tips: My house did not smell amazing after this project especially after the turmeric. I left the eggs in for about 24 hours. Put them in something that seals like a mason jar and put them in the refrigerator after they have cooled enough to put a lid on. After many tries the jar is what gave me the colors I wanted. If using the jars make sure to stir eggs once in awhile to they color evenly. These recipes are easily adjusted for how many eggs or hues you want to achieve. Aimee Morrisey Certified Holistic Health Coach and graduate from Integrative Nutrition. As a longtime cook, Aimee enjoys incorporating organic, natural, and GMO Free ingredients into her recipes focusing on vegetarian and gluten-free cooking.